Arthur Guinness (1724/25-1803) from an Anglo-Irish protestant family founded brewery Guinness in Dublin in 1759. 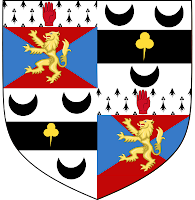 His great grandson Edward Cecil Guinness (1847-1927) was created Earl of Iveagh on 30-9-1919. 69. Mary Harriet Anne Loftus * ... + 7-11-1880; Dr van William Fraser Bentinck L.
71. Julia Sarah Hayfield Fortescue * ... + 3-11-1893; Dr van Edward F.
73. Maria Augusta Windham * ... + 31-10-1871; Dr van vice-admiral William W.
77. Charlotte Mills * ... + 22-8-1903; Dr van Sir Charles M., 1.Bt. 79. Cornelia Charlotte Anne Dumaresq * … + 11-2-1911; Dr van Henry D.
81. Ann Reid * ... + 3-4-1868; Dr van John R.
85. Kate Moyers * ...; Dr van Joseph M.
89. Sarah Dickinson * ...; Dr van Weetman D.
91. Hannah Gamble * …; Dr van Robert G.
95. Anne Murray Lennock * …; Dr van admiral George Gustavus L.